I usually have about three books going at any one time. Currently, I am reading The Next Person You Meet in Heaven by Mitch Albom and Harvey Penick’s Little Red Book: Lessons and Teachings of a Lifetime of Golf, and I am rereading my favorite book, Atlas Shrugged by Ayn Rand. I was diagnosed with multiple sclerosis five years ago, and it has taken my ability to type very fast. I could not live without my Dragon dictation program on my computer and phone. It allows me to stay connected and productive. The last app I downloaded was Venmo. It has opened up a whole other world for paying bills and expenses. I get most of my viewing done while traveling. I just got done watching “Ozark” on Netflix and “Goliath” and “Man in the High Castle” on Amazon. Anywhere with my family. I think our most favorite vacation was a trip a couple years ago to Mississippi and New Orleans. We just love the culture and the people. Running kids around has been my life for the past decade. Outside of family, I love hunting, golf, boating and skiing. My favorite family tradition is inviting all our friends over for Christmas Eve, making jambalaya and homemade peppermint ice cream, and reading ’Twas the Night Before Christmas to the kids. Even though my kids are in high school and college, they love when I read the story to them. This is a great time to get into the industry. With the graying of the advisor force, there will be lots of opportunity for young advisors, especially women. But it will take hard work, and don’t think you will get rich fast. It’s a get-rich-slow business. I have been blessed with dozens of mentors throughout my life who have both shaped and formed me. I believe you can learn even from those who are not good leaders. In fact, some of the best lessons I learned by people’s bad behavior were what not to do. However, my dad long ago told me, “Never confuse activity with accomplishment.” That seems to be great business advice that he taught me. I believe you should hire good people, give them responsibility, delegate authority and then hold them accountable. I am always there as the teacher, a mentor and a coach. The great transition of wealth between generations. It is increasing the need for financial advice. At the same time, the number of financial advisors is falling. 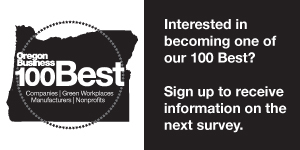 To subscribe to Oregon Business, click here.